An intelligence agency ignored its own government and ordered an assassination. On July 23, 1914, Austrian diplomat Baron Giesl von Gieslingen delivered an ultimatum to the government of Serbia. 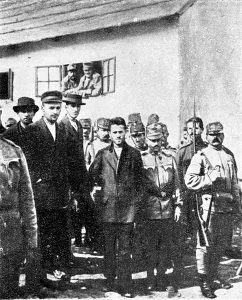 A young killer named Gavrilo Princip succeeded in murdering the Archduke on June 28, 1914, shortly after a failed attempt by one of his nine co-conspirators. The conspiracy seems to have been arranged by the head of Serbian Army Intelligence, Dragutin Dimitijevik, without the knowledge or approval of his government. Princip has often been described as an “anarchist,” but he was apparently part of a popular movement that sought the formation of a new nation-state that would come about by the joining of Serbia with Herzegovina and Bosnia. Princip fired on the Archduke at close range, striking the Archduke in the neck and hitting the Archduke’s wife in the abdomen. Princip turned his pistol on himself, but police and spectators took him under control before he could fire. According to Serbian law, Princip could not be sentenced to death because he had not quite reached his 20th birthday. Instead, he received a 20-year prison sentence, but died in prison of tuberculosis four years later. 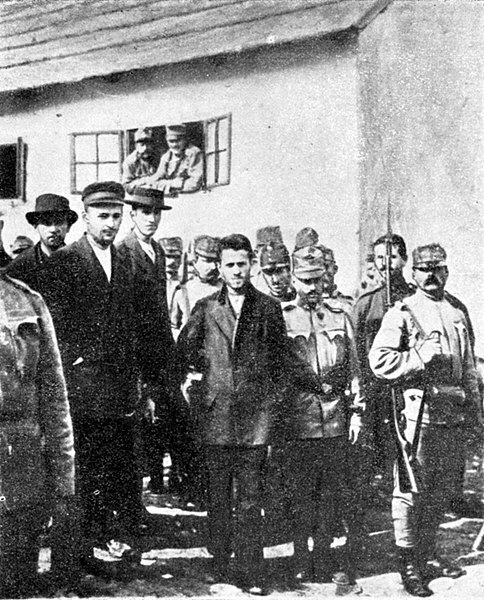 Gavrilo Princip (Center) being brought to court. The ultimatum that Gieslingen had delivered had been carefully crafted by the Austrians and their German allies to ensure a negative response from Serbia. The letter demanded a response within 48 hours. Germany and Austria-Hungary had calculated that Serbia would reject the ultimatum, and that they would then invade, capture, and annex Serbia before its ally, Russia, could mobilize a response. They assumed that, when presented with a fait accompli, Western Europe would loudly protest, but not mobilize against Germany and Austria-Hungary. On July 24, 1914, in response to Serbian pleas for help, Russia ordered a partial mobilization of its large, but poorly equipped army. On July 25, the Prime Minister of Serbia, Nicola Pasic, ordered the Serbian army to mobilize, and he personally delivered a response to the Austria-Hungarian embassy. He agreed to all terms but one. Serbia would not violate its constitution by allowing Austria-Hungary to take full control of the investigation of the assassination; however, it would allow international observers to participate. On the flimsy excuse that Serbia would not turn over the investigation, Austria-Hungary broke diplomatic relations with Serbia. On July 28, Austria-Hungary initiated World War One by declaring war on Serbia, and it launched what it was sure would be a fast and successful military campaign. The leaders in Vienna envisioned a cheap victory that would result in a vast expansion of the Austria-Hungarian empire. Four years and 16,500,000 dead people later, the Austria-Hungarian empire had vanished. 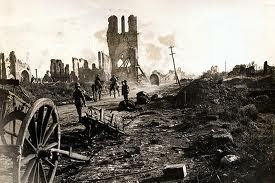 Most of Europe was left in ruin, and the conditions for World War Two were in place. Serbia’s conciliatory response had no chance of stopping the war. Had Serbia agreed to every last condition, new demands would have been made. The flimsy excuse for the war was even flimsier than it might seem. One of the terrible ironies of the crisis is that the Austria-Hungarian royal family and its government were not enamored of Archduke Ferdinand and might have eventually assassinated him themselves had Princip and his co-conspirators not accommodated them. 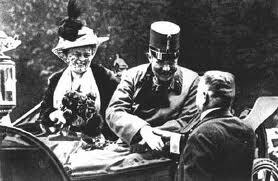 Archduke Ferdinand had become a source of consternation to his Hapsburg family by declining to agree to any marriages that his father wished to arrange, and by insisting on marrying Sophie Chotek. Chotek was a member of a royal family, but not a direct descendant of a European ruler, and, therefore, was not eligible to marry Crown Prince Archduke Franz Ferdinand of Austria. When WWI was explained to me in my fifth grade history class, I felt that the class must have been too short, because clearly some critical detail had been excluded. I was certain that the killing of an Archduke from central Europe could not lead to such a horrendous war. It didn’t. It was the excuse for the war but not the reason. The War was caused by competition between imperial empires. The Austria-Hungarian leaders saw an opportunity that didn’t exist. If the Archduke had never been killed, it would not have changed anything. Germany and Austria-Hungary were waiting for the moment to strike. If need be, they would have created another excuse for the war. They outsmarted themselves, and in the bargain brought a hitherto unimaginable tragedy to Europe, leaving it vulnerable to another war. That next European war would be triggered by an even flimsier contrived excuse presented by an even less likeable Austrian, but that’s a story for another day. Any questions over Austria-Hungary or its flimsy excuse that started WWI? Thanks, Jay. Several things there that I didn’t know.